Members of the Madison Christian Community have declined development opportunities over the years and are intent on keeping most of their seven acres wild, like this restored Wisconsin prairie that fronts the church property at 7118 Old Sauk Road. Alynn McLeod, 6, waters flowers in a garden Thursday at Madison Christian Community. 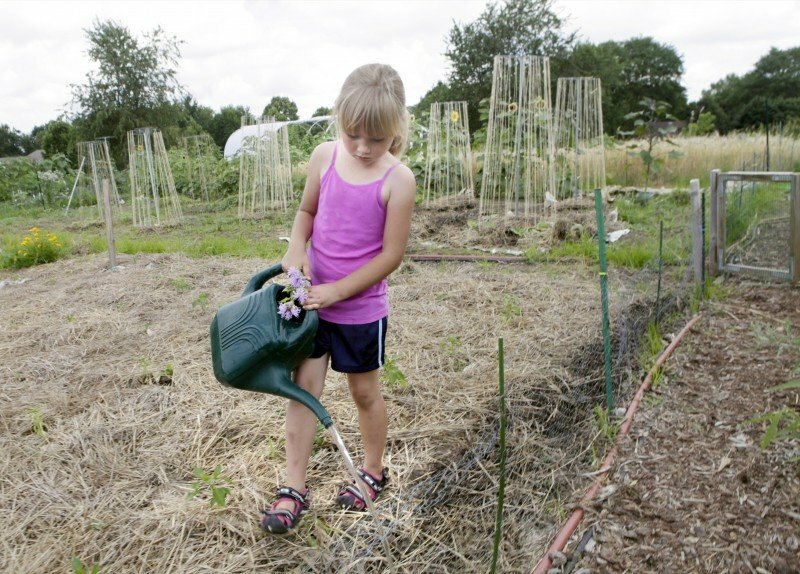 Many church children help tend the garden, as do neighborhood children through a partnership with the nearby Lussier Community Education Center. Rev. Jeff Wild, pastor of Advent Lutheran Church, picks raspberries from the church's garden at Madison Christian Community on Thursday. In a new initiative, middle-school students planted a field of winter wheat last fall. It is close to maturity and soon will be turned into communion bread. Taylor Marbley, 7, picks raspberries at Madison Christian Community. Ruth McLeod, 7, walks past a sunflower in garden at Madison Christian Community. 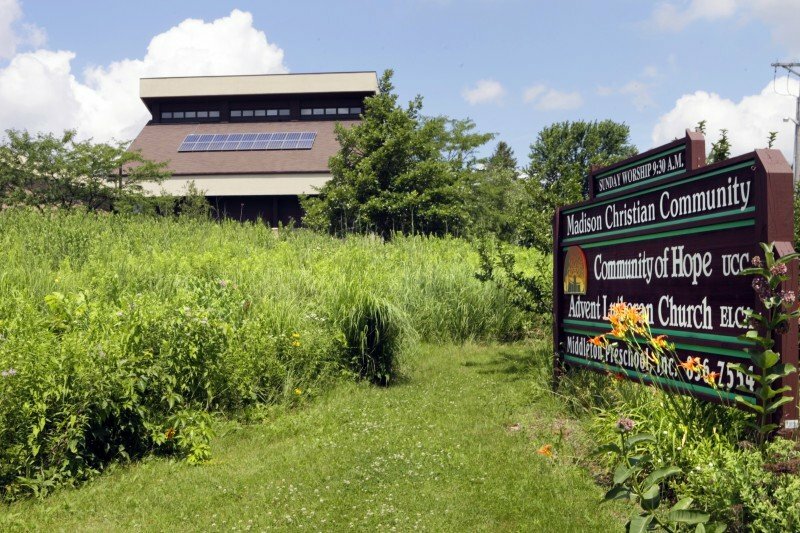 Earlier this year, a developer proposed an office building for a slice of the seven-acre campus at Madison Christian Community, a joint congregation of Advent Lutheran Church and Community of Hope United Church of Christ on the city's Far West Side. The congregation could have pocketed $300,000, but the decision came back quickly from church leaders — the land will remain a natural prairie. "I think it's just a given now that none of the property is for sale," said the Rev. Jeff Wild of Advent Lutheran. For decades, church leaders have declined development opportunities, intent on keeping much of the land an untamed, lush oasis amid an urban landscape. The site is on Old Sauk Road near North Gammon Road, where about 12,000 vehicles pass daily, according to city traffic counts. Increasingly, parts of the property operate as a working farm, with agricultural uses abutting acres of bluestem grass and purple coneflowers. In addition to the church's own large garden, the congregation has set aside 45 plots for community gardeners. More than two acres have been restored to native Wisconsin prairie. It's all part of the congregation's desire to be good stewards of the land — to nurture soil as well as souls. "God gave all of us this land, and he gave it to us for a reason," said church member Jill McLeod. "Not all religious lessons come out of a Bible; some of them come out of a garden." Lois Komai, a church member who has helped nurture the prairies for decades, said she was stunned this spring to see the first evidence of needle grass. She had spread the seeds more than 30 years ago. "You can go years without seeing anything from the seed you put in, and then suddenly something shows up," she said. "It's like faith. Sometimes it takes patience." The two churches came together in 1968. The same year, an area farmer, Herman Dauck Jr., donated most of the land that the church sits on. "His goal was to keep some green spaces on the west side of Madison, and we've tried to honor that as much as possible," said Roger Williams, chairman of the congregation's leadership team. Although the flip side of turning down development means the land stays off city tax rolls, Wild said "the contribution we make to the community far exceeds dollars and cents." Much of the garden produce goes to families at Wexford Ridge Apartments, a federally subsidized housing neighborhood nearby. Many Wexford Ridge children help tend the garden through a partnership with the Lussier Community Education Center, which also receives produce for its food pantry. "Given what's going on in the world, growing our own food and sharing it with each other is what's going to sustain us in the long run," said Susan Gruber, one of several church members volunteering Thursday in the garden with Wexford Ridge children. Each year brings expanded environmental efforts. The garden tractor runs on used vegetable oil. Ten percent of the site's electricity comes from solar panels. Captured rain nourishes the gardens. Last fall, a confirmation class planted a small field of winter wheat. The grain will be harvested next week and turned into communion bread. A few weeks ago, a chicken coop with five hens was added. Parishioners and neighborhood children rotate chore duties. Egg sale profits go toward purchasing chickens for farmers in developing countries. What's next? Wild said he's researching the possibility of a worm farm. Neighbors may be relieved to learn one thing has been ruled out — a study found the site not suitable for wind turbines.